I received a complimentary copy of this book to facilitate my post and review. I was not required to leave a positive review and the opinion given herein is 100% mine alone. We’ve established previously that parenting is tough. There is no guide, there is no manual. You aren’t handed a “How-to Parent” guide in the hospital. And you can read as many books on parenting as you’d like- and you still may not have all the answers. As a parent of special needs kids, there have been times that I was on the brink of losing hope. That I questioned the light at the end of the tunnel. I wondered, some nights, if there was ever going to be a bright moment. 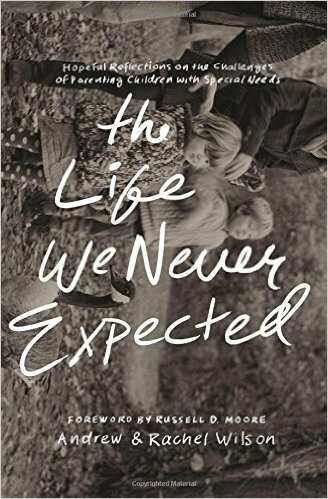 It was during those times that I wish that this book, The Life We Never Expected, had been in existence. Written by parents of two autistic children, this book provides much needed hope and encouragement. What do you do when hard or painful circumstances turn your world upside down, resulting in a life you never expected? Andrew and Rachel Wilson grappled with this question after both of their children were diagnosed with regressive autism. Refreshingly honest, this book explores the highs and lows of raising children with specials needs, reflecting on the broader question of how to cope with suffering of all kinds. Sharing personal stories from their lives and encouragement rooted in the truth of God’s Word, Andrew and Rachel highlight lessons they’ve learned related to fighting for joy and thriving in the midst of trials—ultimately pointing readers to Christ, the One who promises to make all things new. Since receiving my review copy, I’ve read through the book in it’s entirety twice. Once was on the day that I got it, thinking that I would just read one chapter. But then one chapter turned into another and another. And before I knew it, I was reading the book notes and Scripture index. The second time I read the book, I made sure to have my Bible by my side so I could easily reference the scripture that was included. And it made sense. So much sense. Parts of this book, I felt like I could have written them myself. Perhaps you’ll feel the same way if you pick up a copy. And it is true: this life is not what we expected. But it is the life that we have been given. This book gives me renewed and continued hope. And is a constant reminder that no matter what, Jesus is there. I just have to look.